Rumsiskes park is located 25 km (15 miles) from Kaunas. It covers an area of 160,000 m². The ethnographical open-air museum depicts the life of peasants during the late 19th and early 20th centuries. Lithuania's four ethnographical regions are represented: Aukstaitija, Dzukija, Suvalkija and Zemaitija. Each section is highlighted by buildings and farmsteads characteristic to the specific region. The interior of the farmhouses in each section is decorated as if it was still inhabited. Song and dance ensembles often come to Rumsiskes during the Summer months. 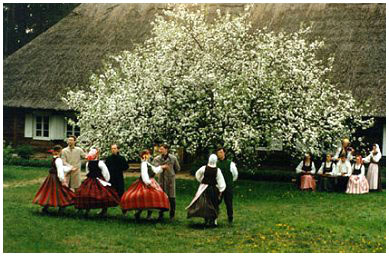 Traditional celebrations such as Midsummer's Day and Thanksgiving are very popular, and usually attract a jolly crowd. Visitors can get around the park by way of riding or driving in a coach.